Charlotte’s first anime convention – How Do You Figure? I’d gotten word about a month ago that a new anime convention was coming to town. Billed as “the Carolinas’ first anime con of the new year,” it promised to be three days worth of exciting anime goodness. Since it was only a short drive from where I live, I decided to give it a visit. The organizers have dubbed this new foray into the American convention scene Ichibancon (www.ichibancon.com). It was held at the Great Wolf Lodge and Resort in Concord, NC, just a couple minutes north of central Charlotte. Given that this was a startup, I didn’t set my expectations very high. The venue itself wasn’t extremely large, so space and attendance would be limited. With that in mind, I set off last night after work to sample the offerings. The Great Wolf Lodge is actually a family resort/indoor water park. It has a hotel, restaurant, and caters to families with younger children. The con itself was contained in the conference area of the resort, meaning there was minimal disruption to the lodge’s normal activities. 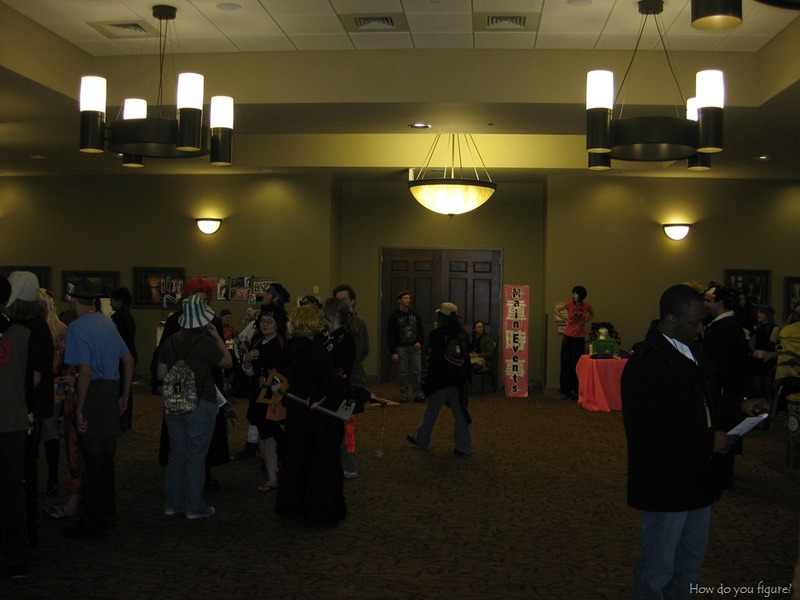 There were two smaller rooms for panels, a large room for main events, and a vendor area. There was also a small nook set aside for various game systems. The above photo was what greeted us when we went through the front door. Registration was in the main lobby and was run pretty efficiently. The organizers must have had some experience in the past, or had figured out how to handle the traffic. While the lobby remained mostly clear on the first day, it quickly became the center point of any mass cosplay photo op. It was the only space large enough that could hold people. Going outside was pretty much out of the question, as temperatures in Charlotte hovered around the 40 degree mark during the day and dipping below freezing after the sun went down. The vendor area had about a dozen different sellers peddling various wares from swords to clothing. One seller had a small stock of bootleg CDs and DVDs, which was a bit disappointing. At bigger conventions this is usually more common, but with a smaller group like this, I wonder if it’s possible (or feasible) to police such things? Only one seller really had a selection of figures, although not extremely large. One thing that struck me as odd was the types of merchandise being sold. While there was your typical Shonen Jump and Final Fantasy paraphernalia, there was also a surprising amount of Sailor Moon goods. For a series that hasn’t been on air in almost a decade, that’s pretty odd. Since there wasn’t a huge variety of newer stock, not much caught my eye. I did score one figure for my collection… Holo from Spice and Wolf. In all, the first year of Ichibancon was a great effort. Hopefully, this year’s success will lead to future growth and return in subsequent years. One thing the organizers may want to consider is having a dedicated cosplay meet up area. That way, crowds don’t gather in the central area and cause trouble for folks trying to get from one side to the other. I’ll be going back tomorrow afternoon for the last bit of the event. There is an Asian BJD panel at noon, and Rin will be attending it with me. Hopefully she’ll have the opportunity to meet others like her and share stories! Nice to see that Ichibancon turned out ok. I couldn’t make it since I already had plans for the day. I’ll definitely be at Animazement in a couple months for my groups first panel. Hope to see you there!